Peridot is the amazing birthstone of August. A unique stone with a striking colour and such interesting properties. In this blog we delve into the history, formation and properties of peridot, as well as give three step-by-step jewellery making projects using this beautiful gemstone. 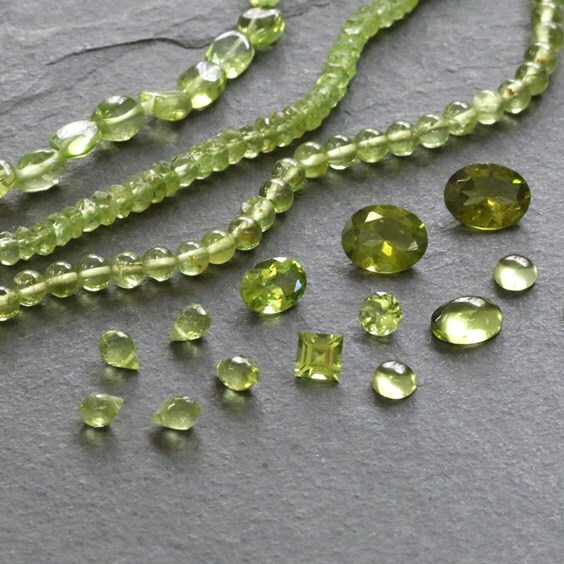 As big fans of peridot we supply the stone in a range of cuts, shapes and sizes for jewellery making, you can view our whole range of peridot here. Colour: Yellow- Green, Olive Green, Brownish, Honey, Bottle Green. Ideally a rich rich 'oily' green. Appearance: Opaque - clear crystal when faceted and polished. Rarity: Easily obtained - high quality crystals are rare. Sourced: China, Brazil, Egypt, Ireland, Russia, Australia, Hawaii, South Africa. 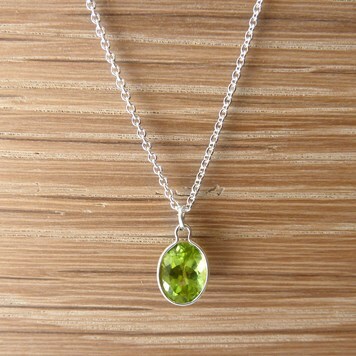 Peridot is a variety of the mineral olivine. It is a magnesium iron silicate mineral and occurs in bassalts and peridotite rocks. Iron causes the colour within this gemstone and the amount present determines the shade and depth of the green. Peridot was brought to Europe by 'The Crusaders' in the Middle Ages. It came from St. Johns Island (Egypt) in the Red Sea where it had been mined for over 3,500 years. In Europe the stone was often used for religious purposes. The meaning of the name Peridot is uncertain. Some believe it derives from the Greek language, however it is also said to be a french word that possibly derived from the Arabic word 'faridat' meaning gem. As a highly spiritual stone, Peridot used to be believed to keep away evil and spirits. It is a protective stone and one that is particularly helpful for healers. It is believed to be a visionary crystal that helps you to understand your destiny and your spiritual purpose. The stone is known as a powerful cleanser that neutralises toxins on all levels. It is an excellent source of high frequency vibrations that is said to help multiply your wealth and increase your health. In The Crystal Bible by Judy Hall, Peridot is described as a stone that alleviates jealousy, resentment, spite and anger and reduces stress. It is believed to enhance confidence and assertion without aggression. Peridot is a strong healing crystal, said to heal and regenerate tissues. It also also said help with liver and gall bladder problems. Placed on the abdomen, many believe that it aids giving birth by strengthening the muscle contractions and lessing the pain. 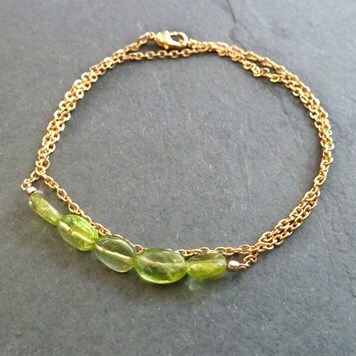 We love Peridot here at Kernowcraft and think it is a beautiful and very versatile stone. It has a strong unique colour that looks good when used with both gold and silver. As a faceted stone it can create a very classic, timeless look, yet as a cabochon or bead it can create a very pretty and fashionable design. 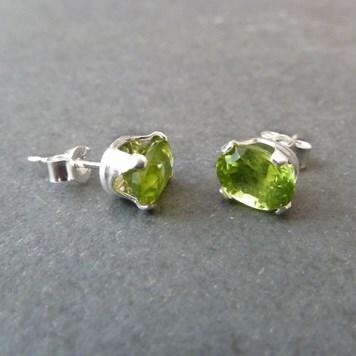 We supply Peridot in a range of shapes and sizes, click here to view our collection. Taking inspiration from this beautiful gemstone we have created a few Make The Look projects using Peridot. These designs are all really easy to make and require little tools. Our Make The Looks are our inspiring easy to re-create jewellery designs. We provide step by step instructions, as well as all of the items needed to complete the design listed in one neat shopping list. Be sure to share you creations with us on social media, we would love to see them! Gemstones - Woodward, Oldershaw, Hearding.